The world financial system is booby-trapped with unprecedented anomalies, deformations and contradictions. It’s not remotely stable or safe at any speed, and most certainly not at the rate at which today’s robo-machines and fast money traders pivot, whirl, reverse and retrace. Indeed, every day there are new ructions in the casino that warn investors to get out of harm’s way with all deliberate speed. And last night’s eruption in the Japanese bond market was a doozy. 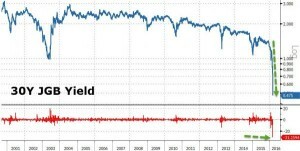 The government of what can only be described as an old age colony sinking into certain bankruptcy sold 30-year bonds at an all-time low of 47 basis points. Let me clear here that we are talking about a record low not just for Japan but for the history of mankind. To be sure, loaning any government 30-year money at 47 basis points is inherently a foolhardy proposition, but its just plain bonkers when it comes to Japan. Here is its 30-year fiscal record in nutshell. Not withstanding years of chronic red ink and its recent 2014 consumption tax increase from 5% to 8%, Japan is still heading straight for fiscal oblivion. 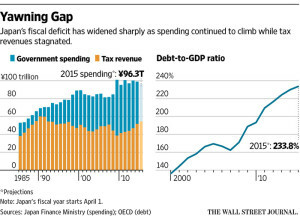 Last year (2015) it spent just under 100 trillion yen, but took in hardly 50 trillion yen of revenue, stacking the difference on its already debilitating mountain of public debt, which has now reached 240% of GDP. That’s right. A government which is borrowing nearly 50 cents on every dollar of outlays should be paying a huge risk premium to even access the bond market. But a government with a 240% debt-to-GDP ratio peering into a demographic sinkhole would be hard pressed to borrow at any price at all on an honest free market. The graphs below show what lies 30 years down its demographic sinkhole. 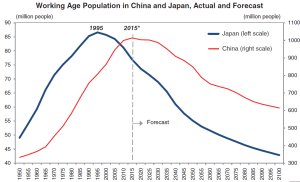 To wit, Japan’s population will have declined by 30% to 90 million, while its working age population will have plummeted from 78 million to about 52 million or by 33%. Moreover, its labor force participation rate has been declining for years, but even if it were to stabilize at the current 60% level, it would still mean just 31 million workers. 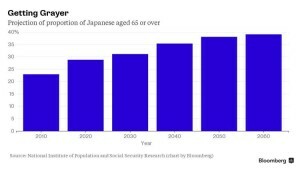 The trouble is, Japan already has 31 million retirees, and that number is projected to hit 36 million by 2060. In short, at the maturity date of the bonds the Japanese government sold last night, Japan will have more retirees than workers; it will be at a fiscal and demographic dead end. 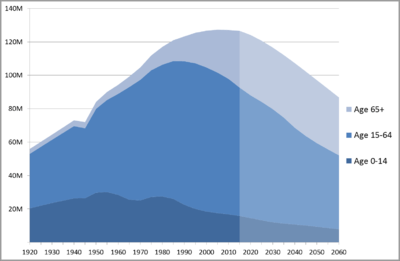 So how did Japan sell billions of 30-year bonds given these catastrophic fiscal and demographic trends? The short answer is that it didn’t sell anything to investors. Instead, it rented what amounts to a put option to fast money traders. The latter operate from the assumption that they can cop a capital gain in the next while and then sell the paper back to the BOJ. And why wouldn’t they make that bet. The lunatics who run the BOJ have essentially guaranteed that they are the buyer of first and only resort for any Japanese government debt that remains outside of their vaults. Indeed, central bank announcements of negative yield are a form of code in the canyons of Wall Street and other financial markets. It means moar central bank bond-buying ahead, and therefore rising prices on the trading bait infused with the financial Viagra of NIRP. As of last night’s auction, the entire JGB yield curve is now negative out to 13 years. That means that $5 trillion of bonds issued by the most fiscally impaired major government on the planet have been pushed into the netherworld of subzero returns. Needless to say, the government of Japan and the BOJ are not in the midst of some exotic experiment that is off the grid relative to the rest of the global financial system. To the contrary, they are implementing Keynesian central banking and fiscal policies on a state of the art basis. They are doing what Bernanke, Krugman, the IMF and heavyweight (on all counts) Keynesian blowhards like Adam Posen have recommended for years. “stimulus” policies were just what the economic doctors and policy apparatchiks assembled in Shanghai ordered. Later this week, in fact, Draghi will make another plunge in the same direction. Already, more than $2 trillion of European government bonds are trading at negative yields, and for the same reason. To wit, the central bankers of the world have created a front-runners paradise. Yet so doing they have stood the very concept of a government bond in its head. Whereas the legendary British consol traded for nearly 200 years (outside of war interruptions) at par and to a rock solid 3% yield, today’s sovereign debt is being turned into a gambling vehicle where financial gunslingers and hedge funds play for short-run capital gains on 95:1 repo leverage. in a word, the central banks have nearly destroyed the government bond markets. In the process, they have flushed trillions of capital into corporate debt and equity in search of yield and momentary trading gains with scant regard for the incremental risks involved. So, yes, the casino is implanted with FEDs (financial explosive devices) everywhere, including upwards of $60 trillion of sovereign debt that is radically mispriced; and which must eventually implode when the gamblers finally stampede out of the casino. 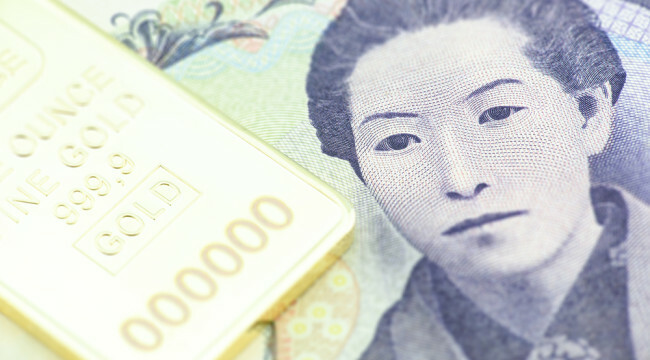 Perhaps last night’s Japanese bond auction was an omen, after all. 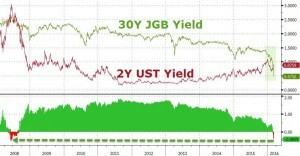 The JGB 30Y yield is now below the UST 2Y for the first time since, well, the Lehman event of September 2008. Shortly thereafter, of course, our befuddled President at the time, George W. Bush explained the macroeconomic situation in a way that even the Congressional leadership assembled at the White House could understand. “This sucker is going down”, he told them. He got that right. It was just a matter of time.